Did you know that Village Home Stores services the entire extended Quad Cities Region? What does that mean exactly? It means that our showroom in Geneseo, IL us really just a short drive away from many cities in the surrounding Illinois and Iowa area. Eldridge Iowa is a wonderful example of one of those cities. In recent years we have had our design and product installed in both new and existing homes there. This week’s feature project is a remodeled Master Bathroom just 35 miles away from our showroom in Eldridge. Take a look at this great new space. We have replaced the single sink vanity area with a double-bowl layout. Cabinetry from our Koch Classic line in the “Bristol” door and Maple wood species. Our bestselling gray neutral “Fog” paint is applied with Satin Nickel Bremen handles. 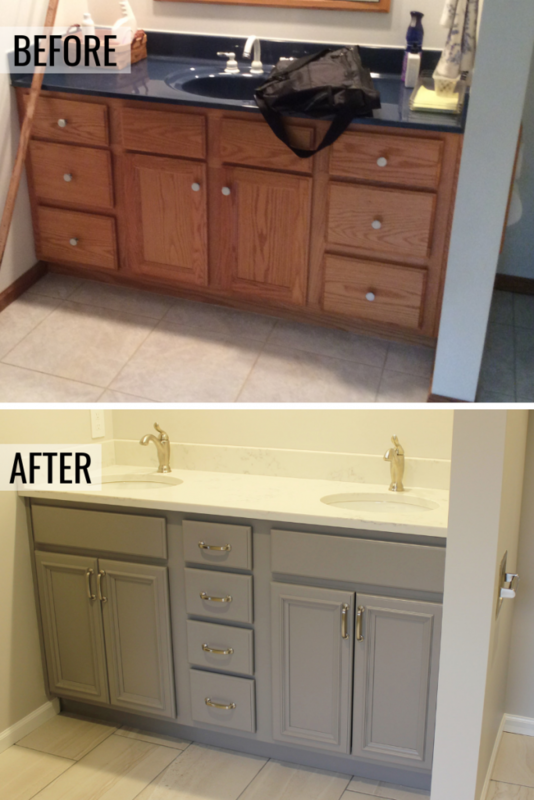 A closet area has been converted to a stylish laundry nook inside the Master Bath. 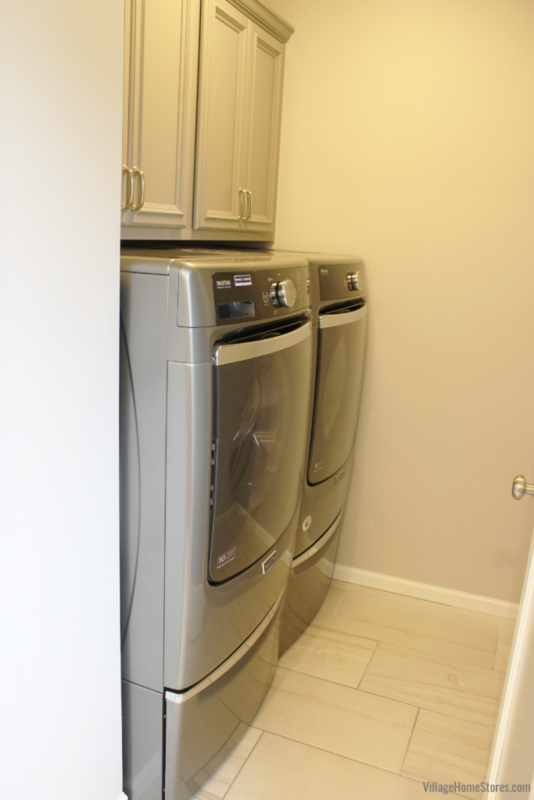 Wall cabinetry hangs above a front-load washer and dryer from our Maytag line. Having laundry located on the main level of a home can be such a convenience! And with these front-loaders now located in the Master Suite of the home, sorting and putting away laundry is just steps from the machines. We also installed a wall of cabinetry opposite the washer and dryer that includes a tall cabinet and a hanging rail. Aren’t those custom wall niches great!? Symmetrical shelves make it easy to separate and store toiletries and soaps. 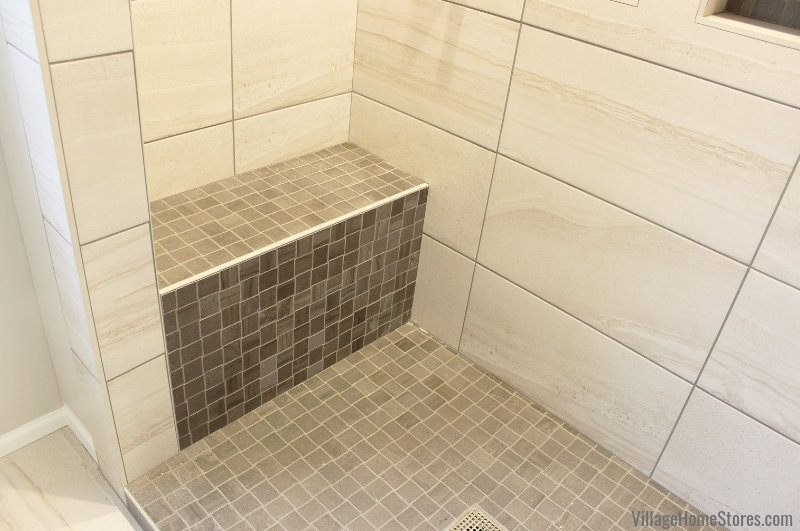 The accent tile used as the shower floor, bench, and inside of these niches is also banded around the shower walls. 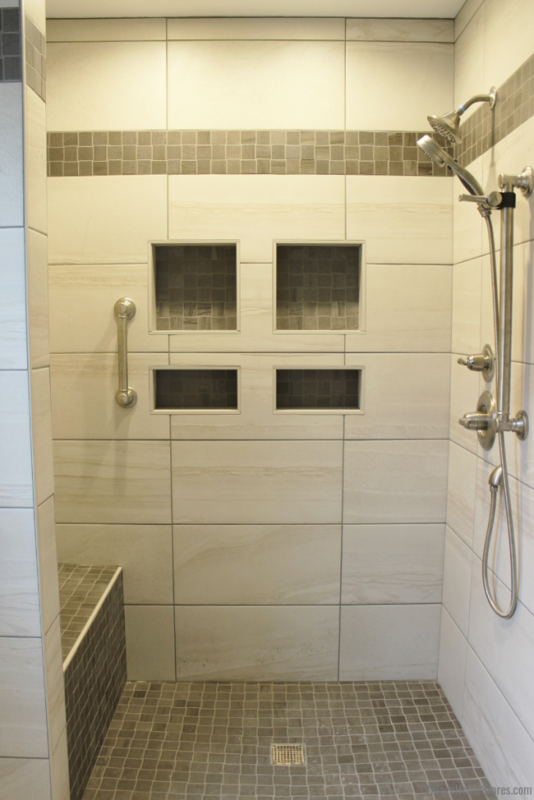 The 2″ x 2″ basket-weave tile is from the same Ameila series as the wall tiles but in the contrasting “Carbon” color. We love how the bench area looks like it just waterfalls down into the shower floor in this home. 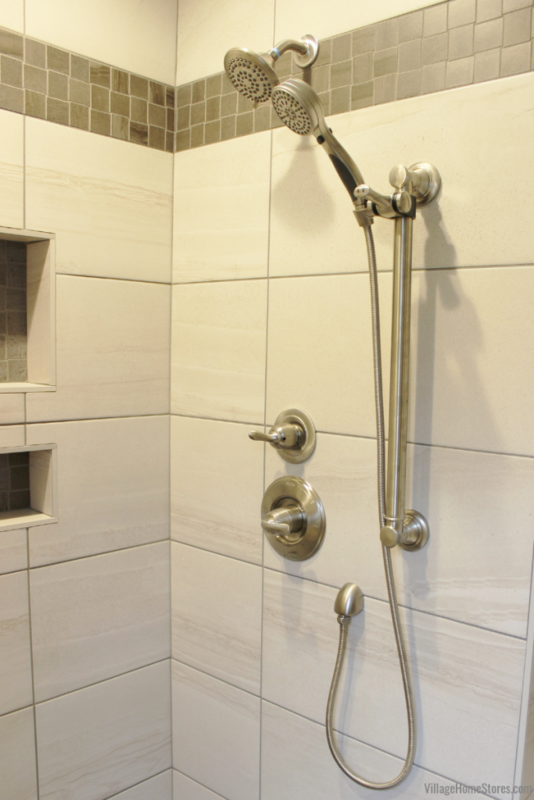 A Delta shower head and removable hand wand was installed for the new shower. Notice that the wand is adjustable for location and it is attached to a grab bar for added safety. 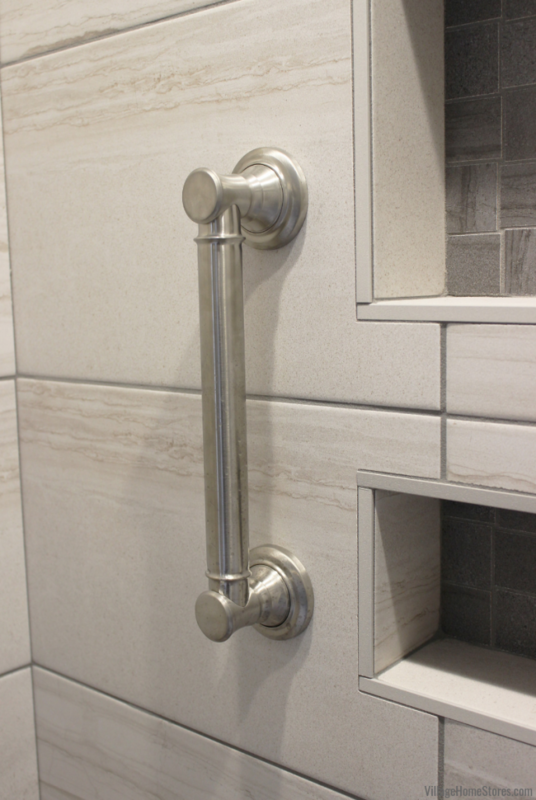 Including grab bars in a bathroom remodel is a wise investment for any home no matter your age or ability. 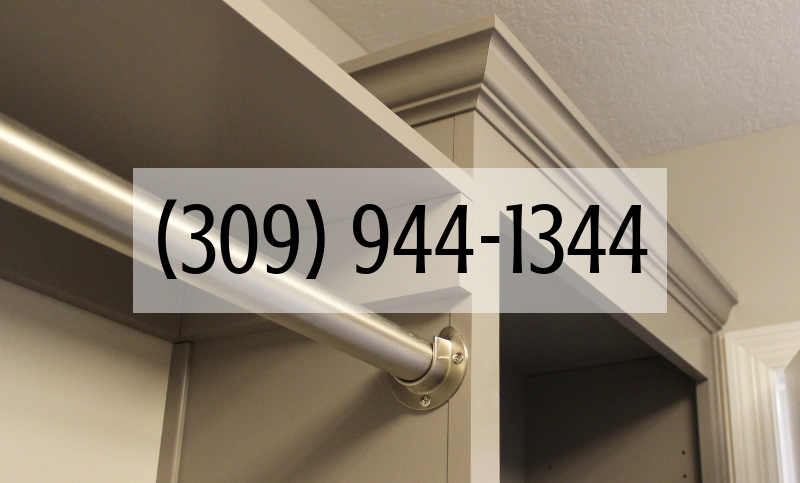 Age-at-home features like these grab bars add a level of safety for all users and certainly add a priceless piece of mind to your remodel selections once everything is installed and finished. We included another storage area above the new toilet in the bathroom. 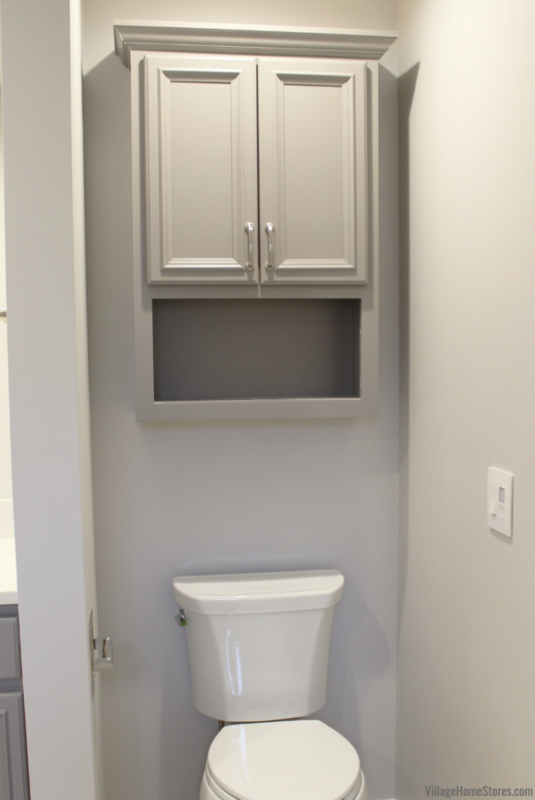 These stand-alone cabinets are called “toilet toppers” and typically include an open shelf space as well as a concealer door area for toilet paper and other items to be stored out of sight. Next to the toilet is a great example of our Radiant series of switches and outlets. Notice how this series has no visible screws!? We love that clean look and detail. 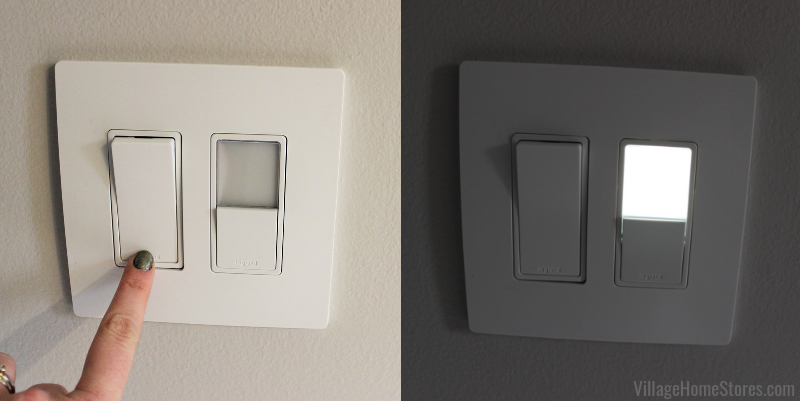 This series has many great options including a nightlight (shown off/on below). 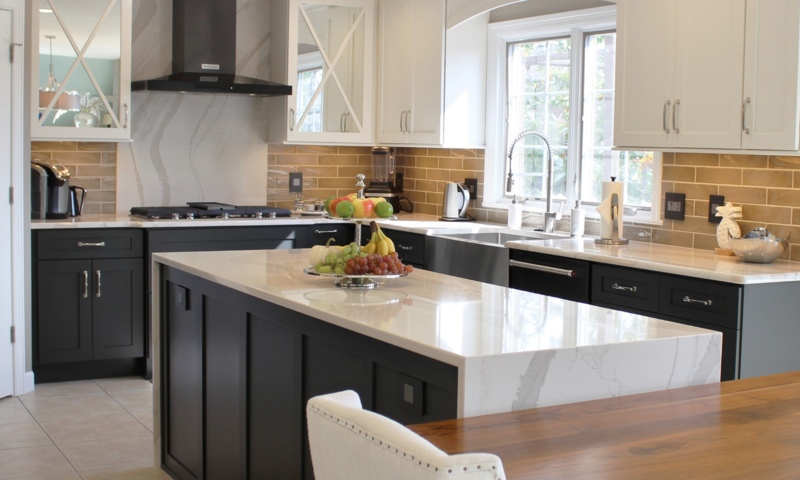 In keeping with the other clean and fresh material selections, a marble-look quartz counter was installed to replace the original navy blue cultured marble top. 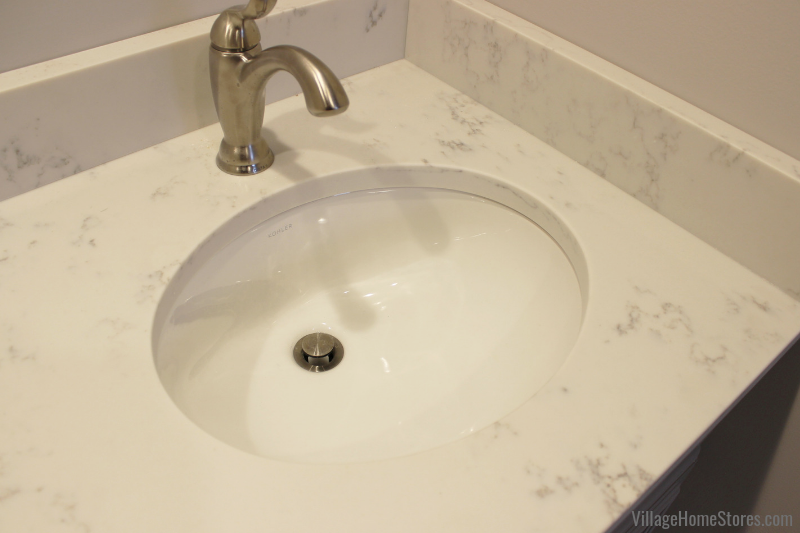 This color is the Carrara Grigio design with an undermounted Caxton sink. A quartz backsplash and endsplashes complete the look. Are you ready to start the conversation about your own before and after story with us? 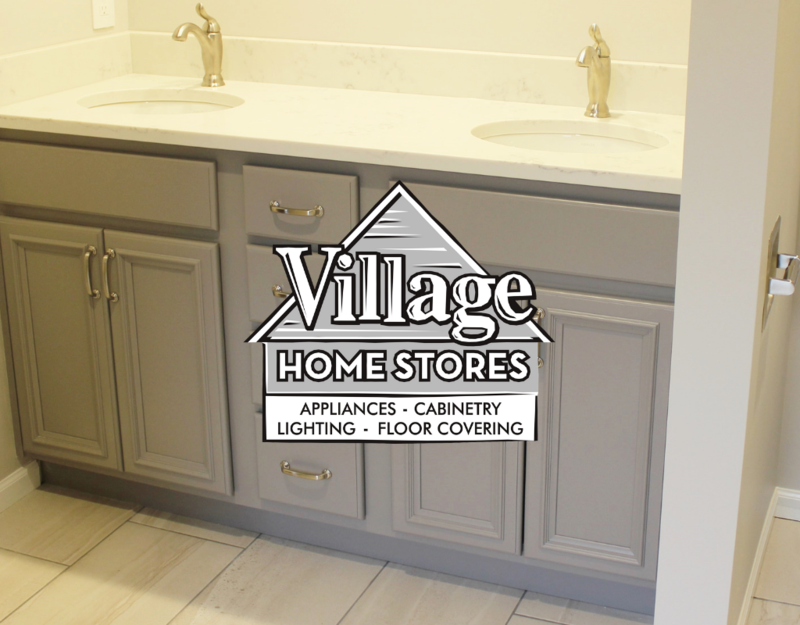 The Village Home Stores team can help as little or as much as you need. Have your own contractor or want to do the work yourself? That’s wonderful! We can provide you with design and materials for your project. If you would like to have us handle it all for you from start to finish, that is where we excel! Our remodel process is designed to help your project stay on schedule and on budget. If you are ready to get started on a remodel with us just reach out! Call us at 309 944-1344 or complete this short online form and a member of our team will reach out.